A long time ago I wrote an article called Burritos and your Brain. The article examined the ill received reactions from loyal customers when Chipotle decided to change their marketing design in an attempt to introduce a new logo, and how Chipotle promptly returned to their familiar marketing design shortly there after. A little over a month ago I was driving when I spotted a billboard in the distance that looked like Chipotle’s marketing design. As I got closer I nearly crashed my car. Why, you ask. Because Chipotle had made changes to their marketing design yet again, but this time they absolutely nailed it. This was the exact Chipotle advertisement that I saw. This Ad is a Puzzle. The brain loves simple puzzles. Puzzles shake us out of our subconscious auto pilot and demand our conscious attention. With this ad you can see the bold words calling out to you, forming it’s own simple message, but it only draws you in more because you have to read the sentence that the bold words originate from. Rather than this ad just be noticed, it actually causes the consumer to consciously interact with it. The Buying Brain Loves Puzzles. 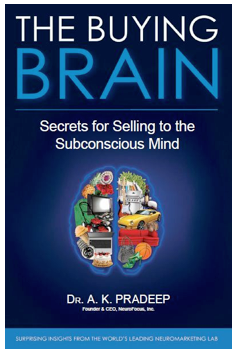 CEO of NeuroFocus Dr. Pradeep does a fantastic job of describing this in more depth in his book The Buying Brain. The Ad is Salient. Chipotle’s marketing design was originally created to stand out against the clutter and noise of most marketing design that fills are daily environments, and it has historically worked for them. This ad is no different. The brain loves clear contrast, and it doesn’t get any clearer than “black and white”. That’s exactly what you get when you see this ad. The black bold words pop off the white background. This ad is clean, clear and contrasting – all the things your brain likes. Great use of Font. The “Confidential Font Type” is bold and noticeable compared most other marketing design. It’s also synonymous with Chipotle. How many other companies do you see using this font on a national level? None, exactly. The font is also uniform, meaning that the letters are all the same case. In advertising the brain actually prefers when the font is uniform. Good Logo Use. The use and placement of the logo in the ad is very important. The use of the Chipotle logo is subtle. Studies have shown that brain prefers the subtle use of logos. Company logos that are too in-your-face have actually shown negative perception from consumers’ brains. That is definitely not the case here. Good Logo Placement. Keep in mind that this ad was placed outside, so you want your message to be centered and high on the background so it draws vision upward. The logo placement defers to the message itself letting, it go front and center. The logo is also placed on the right side of the ad. Images should be placed on the right side of material because it’s perceived with the left side of the brain – the side of your brain that is best at processing images and pictures. I am glad to see Chipotle continuing their marketing dominance. I cannot express how hungry I am for Chipotle after writing this article. Steak burrito, here I come! Thanks for stopping by social-brain, and thanks for reading!